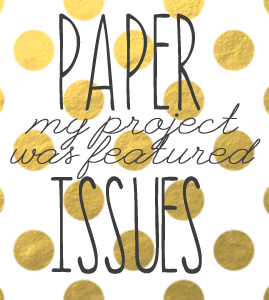 Did you know that Paper Issues has free printables each month? They are so fun and perfect for layouts, Project Life, or even cards. 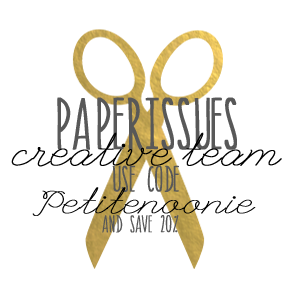 Today on the Paper Issues blog, there is a round up of swag bag and printable layouts. Hope on over to check out all the amazing inspiration. 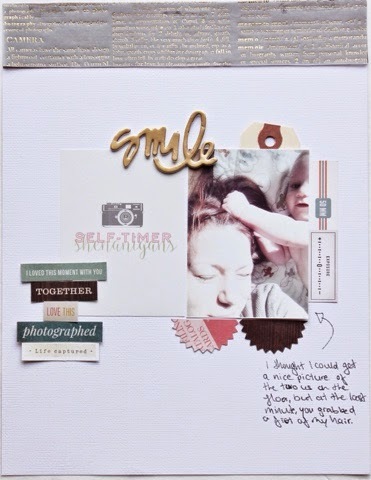 For my layout, I used the 'self-timer shenanigans' card from the April printables. I thought it would be perfect for this photo of my son and I from when he was a baby. It is technically a selfie, but I think it still works here. I thought I would get a cute photo of us laying on the floor together and at the last minute, he grabbed a huge chunk of my hair and this is what we ended up with. I used bits and pieces from Maggie Holmes Open Book collection that I have laying around still. I absolutely loved this collection, but her new collection, Confetti is on its way to me and I adore it too. I wanted to make one more layout with some of my favourite bits from Open Book. I cut some words from a cut apart paper and layered them along the printable. I then used some banner pieces from the ephemera pack beneath my photo and a die cut from the same pack tucked under my photo. I layered some of the amazing gold vellum over the wood grain paper. The title is from Dear Lizzy's Serendipity line. I just love that Thickers are coming in words now. I need so many packages of all of them!